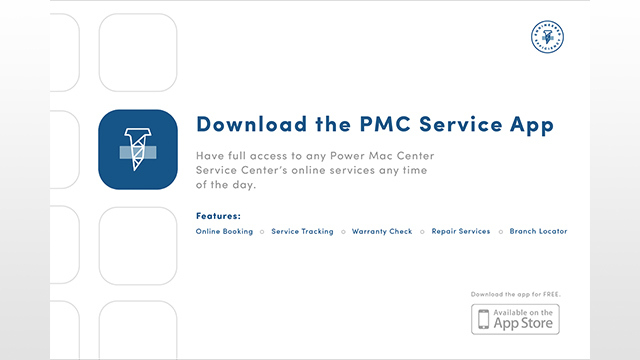 Power Mac Center recently launched an iOS app called PMCService to provide customers with full access to Service Center online offerings. The PMCService App was developed to assist customers with their after sales needs. With it, customers can book appointments, and track device repair status in real time, eliminating the need to personally check on repairs. Customers can also check warranty coverage, and check out the list of repair services covered and available in Power Mac Center service centers, as well as finding the nearest branch. “There is rising demand for real-time access to services and other information among our customers. Power Mac Center wants to provide complete care to the Filipino Apple market so we created the PMCService app, which is the first of its kind, yet to be offered by other Apple Authorized Service Providers in the Philippines.” – Joey Alvarez, Power Mac Center Marketing Director. The PCMService app is available for download from the App Store starting today, October 27, 2017. If you need assistance in downloading and installing the app, you can go to any of the following Power Mac Center Apple Authorized Service Provider: The Annex at SM City North EDSA, Northeast Square, SM Megamall, SM Aura Premier, Glorietta 5, SM Mall of Asia, Festival Supermall, Cebu Business Park, Abreeza Mall Davao, or KCC Mall De Zamboanga.